The biotechnology sector is becoming one of the most popular for trading on the NYSE, due to its attractive returns. Its index is the Nasdaq NBI and the main etf that follow it is the iShares Biotechnology Fund IBB and the S&P Biotech etf XBI. To follow at triple speed in bull mode the Direxion Biotech LABU, is very often followed by traders who do not fear a volatility of 70%. The first focuses on Big Market Caps as Amgen AMGN, Gilead GILD and Celgene CELG, the monsters of the sector, while the second covers more Small Market Cap, smaller biotech companies, which makes the etf more sensitive to volatility . 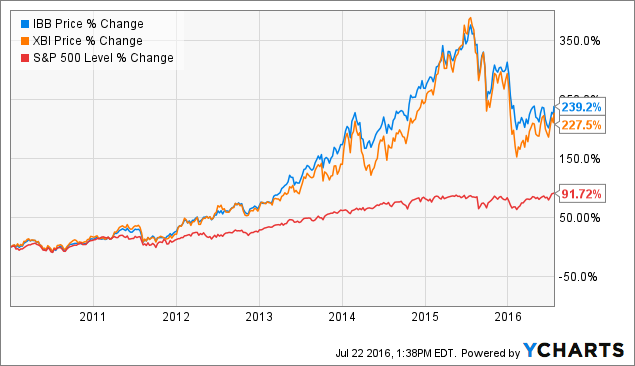 The same both greatly outperform SPX in the last 6 years, as seen in the following graph. As you can see, both etf had a spectacular rise between 2012 and mid-2015, where the mandatory correction came to a support from where, a year ago, comes in a lateral movement. Today they are at an interesting moment after months of uncertainty after the victory of Trump and his silence on the idea of controlling prices and patents of this sector and the pharmacist. Technically the IBB index is testing its resistance to $303.30, forming a double top, so it is suggested to follow it these days to see if it expires. If it succeeds, it will generate a powerful breakout, since its MACD shows a bull trend, and if it does not overcome this resistance it will become a false breakout more, for oblivion. Ideal would also be to leave the overbought area in which it is located. On my radar. Bohlinger (purple). Ideally, enter your 'value zone' (blue lines) for a more accurate trade.